"The Stone Gods new album has a midweek position of number 32 in the national UK album charts!! If you have not purchased your copy yet please do, and help the Gods rock the charts! You can buy it from all good record stores, including Play.com"
So if you haven't purchased a copy yet, do so now to help boost it's position! 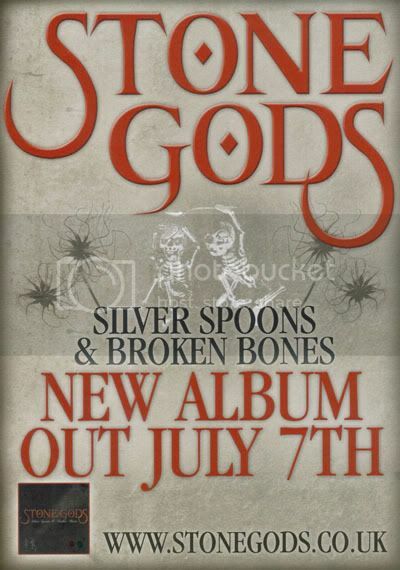 "Well, it's happened, yesterday my band (Stone Gods) officially released our debut album 'Silver Spoons And Broken Bones'. It's been quite a journey from the break up of The Darkness, through the conception and launch of this new band, to the release of our album, good times, dark times, laughter, tears and a whole load of fun and now it's all real, it's happening. We are all hugely proud of this record and, according to comments I receive on here daily, a lot of you guys like it too. Thank you for all your messages of support, I DO read them and it means a lot. Stone Gods Already with an entourage of die-hard fans, both old and new, buzzing around them, there’s a real air of ‘something special happening’ when this band are on stage. Pure Rawk caught up with Richie Edwards, Toby Macfarlaine and Dan Hawkins to talk to them about touring, pub quizzes, dinner parties and punching monkeys. Wishing the Stone Gods a successful album release from all at FlamingWhopper!